Tinnyunt pot - 3" (76 mm) high. 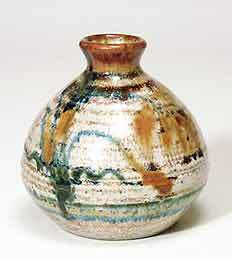 Burmese potter Robert Tinnyunt settled in England in 1962. He worked with David Leach at Lowerdown Pottery in Bovey Tracey, Devon from 1967 to 1970 and then set up his own workshop at Kingsteignton, Devon. Robert makes stoneware pots with brushed decoration.